元代至元通行宝钞，面值贰贯，PCGS Currency 10 Very Good, 有裂及修补. 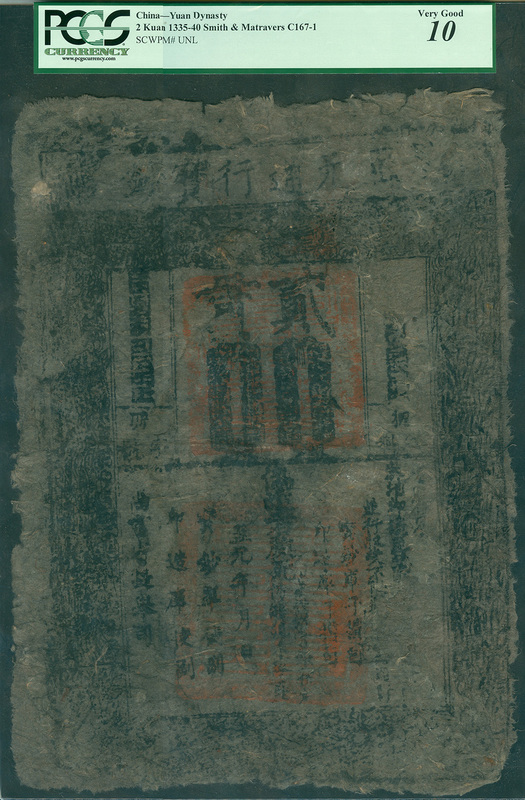 中国纸币 (1949前). Yuan Dynasty, Zhi Yuan Tong Xing Bao Chao, 2 kuan, large sized, black on mulberry bark paper, large red chops,(Pick unlisted, Smith & Matravers C167-1), PCGS Currency 10 Very Good, Splits, Tears and Repairs, very rare.